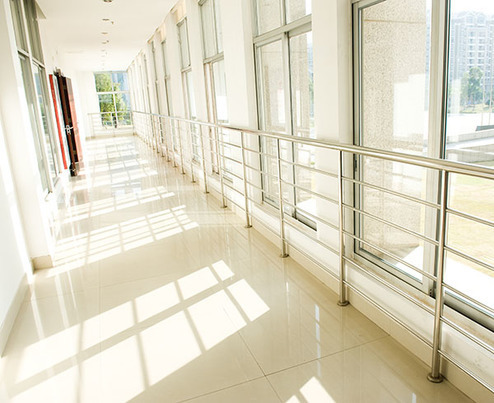 Commercial environments require a more durable floor product than is found in residential applications. In addition, the right flooring can greatly elevate the look and professionalism of an office or business. At Marion Tile, we specialize in working with our clients to provide the “right” commercial flooring—from luxury vinyl tile to marble and natural stone, porcelain, hardwoods, and carpeting. Each adds its own style and character, along with levels of durability, stain resistance, slip resistance, and other performance indicators. As a licensed General Contractor, we are able to develop any needed plans for your project (whether providing you with flooring, bathrooms, break room kitchens, remodeling, or countertops for your entry area or break rooms). We also welcome the opportunity to work with your chosen construction professionals, and regularly work with glass and fixture installers, cabinetry firms, and plumbing and electrical service providers. We welcome the opportunity to assist you with your commercial project.